Have you heard about lick granulomas? If your dog already has one, you may already know how difficult they can be to treat. If you have never heard of them before, what do you need to know in order to prevent your dog from getting one? What is a lick granuloma? What causes them? How are they treated? Is there anything that can be done to prevent them? Here are 5 things you should know about lick granulomas – hopefully before your dog ever develops one. #1 – What is a lick granuloma? A lick granuloma is an irritated patch of skin caused by excessive licking – usually on the front legs – that can remove hair and affect every single layer of skin. It’s usually accompanied by bacterial or yeast infections. #2 – What causes the dog to lick so much? –Boredom, stress, anxiety, or OCD. Licking can be a method of self-soothing, and some dogs react to psychological factors by obsessively licking as an outlet for their pent-up emotions. #3 – Are some breeds more prone to lick granulomas than others? Medium and large breeds are more likely to develop lick granulomas than small dogs. 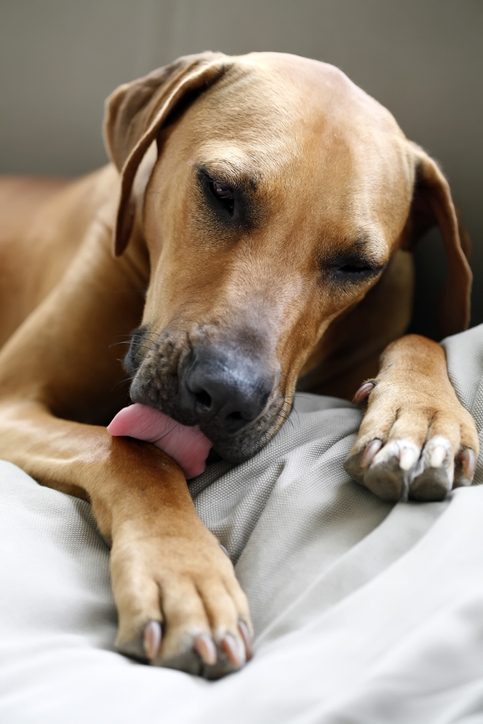 Doberman Pinschers, German Shepherds, Golden Retrievers, Labrador Retrievers, Irish Setters, Great Danes, and Weimaraners in particular seem to be more prone to lick granulomas than other breeds. #4 – How are they treated? -Lasers can be used to remove affected tissue by vaporizing the surface layers of the skin. During this process, there is minimal bleeding and nerve tissue is sealed, resulting in little discomfort that may cause the dog to start licking in the same spot again. -Long-term antibiotics are often used over the course of 3-6 months to help heal the infection. -Cortisone creams applied once or twice daily can help relieve itching that may cause the dog to lick the wound. -Upgrade your dog’s diet and include supplements. -Acupuncture has been shown to have a wide variety of applications, and it may make a big difference in helping your dog to recover from a lick granuloma. -Topical and oral anti-inflammatory medications can help relieve swelling. -Anti-anxiety medications may be prescribed if psychological problems seem to be the underlying cause. -Increasing activity and interaction levels can help prevent boredom and relieve pent-up energy in more productive ways. Try taking your dog for more or longer walks and adding a variety of interactive toys to keep your dog active and his mind occupied.